The National Campaign on Dalit Human Rights (NCDHR), a network of organizations and prominent individuals in India, organized an international conference (New Delhi, 1-4 March 2001) as part of the campaign for the inclusion of the issue of caste-based discrimination in the forthcoming UN World Conference against Racism, Racial Discrimination, Xenophobia and Related Intolerance (WCAR). The conference organizers note that the draft declaration prepared by the UN Office of the High Commissioner for Human Rights and presented at the Inter-Sessional Working Group for the WCAR (Geneva, March 2001) does not have a single reference to caste discrimination. This is inspite of the fact that a series of UN activities, namely, the Seminar of experts on racism, refugees and multiethnic States (Geneva, 6-8 December 1999), the First Session of the Preparatory Committee for the WCAR (Geneva, 1-5 May 2000), the Asia Pacific Expert seminar on migrants and trafficking in persons with particular reference to women and children (Bangkok 5-7 September 2000), the Expert seminar on preventing ethnic and racial conflicts (Addis Ababa, 4-6 October 2000), the Bellagio Consultation (Italy, 24-28 January 2000), and the Forum of NGOs' "End Racism Now" held prior to the European Conference Against Racism (Strasbourg,10-11 October 2000), have all emphasized the need for caste discrimination to be included in WCAR agenda. The four-day conference presented testimonies of victims of caste-based discrimination from several countries. 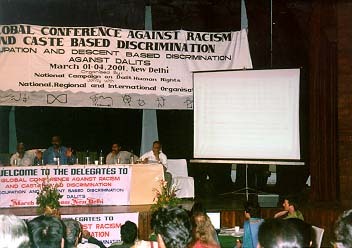 The Global Conference Against Racism and Caste-based Discrimination was convened in New Delhi, 1-4 March 2001, and included representatives and victims from India, Nepal, Bangladesh, Pakistan, South Africa, Japan, Sri Lanka, the Netherlands, Denmark, Germany, Hong Kong SAR, the United Kingdom, and the United States. The participants of the Global Conference strongly condemn caste (occupation and descent based) discrimination and the practice of untouchability, which is the source of immense human suffering and the cause of gross human rights violations and of dehumanising and degrading treatment of 240 million people. We, the participants of the Global Conference, have listened to disturbing testimonies from victims of caste-based discrimination who have suffered extreme violence, abhorrent conditions of work, degradation, exclusion and humiliation. We have also heard from experts, activists, academics, and grassroots leaders about their work to end caste-based discrimination. We appeal to governments and the international community to end this crime against humanity, and we strongly endorse the following declaration. Affirming that caste as a basis for the segregation and oppression of peoples in terms of their descent and occupation is a form of apartheid and a distinct form of racism affecting victims equally irrespective of religion. 1. Enforce and implement an effective and time-bound program to abolish untouchability and similar practices in all spheres. Enact and enforce laws related to compulsory primary education and the elimination of child labour, bonded labour, manual scavenging, caste-bound free labour, the decades system of temple prostitution, and other similar practices. Ensure that all necessary constitutional, legislative, and administrative measures, including appropriate forms of affirmative action, are in place to prohibit and redress discrimination on the basis of caste, and that such measures - including those in Japan and India - are continued until discrimination is eliminated. Monitor and publicize the extent to which existing laws have been implemented. Monitor and analyse educational syllabi and textbooks that perpetrate caste-based oppressions and exclusion, and glorify worldviews that have contributed to the continued existence of a system of "hidden apartheid. " Implement alternatives that emphasize human rights education at the school and university levels. Allocate adequate funds for and effectively implement programs for the socio-economic empowerment of communities discriminated against on the basis of caste or descent. Ensure full proportional representation based on percentage of national population size of Dalits, Buraku, and other groups excluded on the basis of caste in all sections of society including police, judiciary, public service, media, and private industry. Urge statutory and constitutional bodies such as national human rights commissions, on women, race, minorities, and other relevant groups, as well as the Asia-Pacific Coordinating Committee of National Institutions, the African Coordinating Committee of National Institutions, and the International Coordinating of National Institutions, to take up the issue of caste-based discrimination and to support its inclusion in the WCAR. Urge national and state governments to take all measures to combat caste-based discrimination against women. Urge governments not to deny passports to people wishing to attend the WCAR in Durban, particularly Dalit activists. Demand that the caste system be included in the WCAR documents as a major source of discrimination. Call upon the WCAR to underline the necessity for States to adopt immediate concrete measures to eradicate the widespread discrimination and persecution targeting Dalits, Burakumin, and other communities facing discrimination on the basis of caste or descent. Call upon CERD and the Special Rapporteur on Racism, Racial Discrimination, Xenophobia, and Related Forms of Intolerance to reaffirm their position that caste-based discrimination comes under the purview of the CERD and to state that caste should be addressed in the WCAR. Call for a declaration by the United Nations that untouchability constitutes a crime against humanity. Call for intensified efforts at educating the public about the extent of caste discrimination and about the contributions of Dalit culture and history. Urge the appointment of a United Nations Special Rapporteur on caste discrimination. Declare April 14 (Dr. B. R. Ambedkar's birthday) as the International Day of Dalit Solidarity. Recommend that United Nations development agencies pay particular attention to caste violence and caste discrimination, assess the impact of their existing programs with regard to caste, and develop programs and strategies designed to curb abuse and encourage accountability. Untouchability is the subjugation and denial of the basic human rights of people labelled as "impure," a practice sanctified by religious tradition. The Human Rights Commission of Sri Lanka does not subscribe to this section of the declaration.